DAILY & MONTHLY sites AVAILABLE! you have. Our office hours are from 9:00 a.m. to 4:00 p.m.
registration available for late arrivals. We have free WiFi and are within walking distance to a community transit bus stop and Lake Goodwin grocery store and gas station. 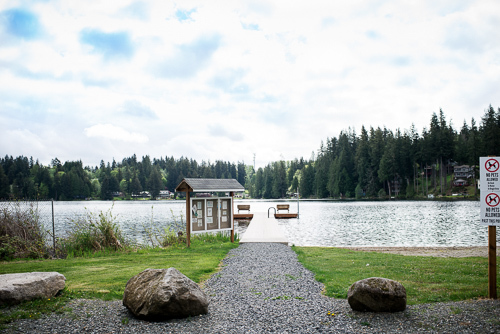 Lake Ki RV Resort & Camp is located on tranquil Lake Ki in the Seven Lakes Region northwest of Seattle, WA. We are convenient to work and play in the Arlington/Marysville/Everett/Seattle area. Within minutes of this rustic resort are two Championship 18-hole golf courses, Tulalip Indian Reservation Casino, the Seattle Premium Outlet Mall, Arlington Airport, Costco, Walmart, cinemas, & a wide variety of restaurants and grocery stores. We have free WiFi at the clubhouse, are within walking distance to a community transit bus stop, and we are less than a mile from the Lake Goodwin grocery store and gas station. around the lake either in your own canoe, or paddle board. Most sites have private fire rings for roasting those perfect hotdogs and toasty marshmallows. Whether looking for that special spot for a get-away weekend or a place to call home while working in the area, Lake Ki RV Resort & Camp is the perfect choice. Please call our office at (360) 652-0619 for more detailed information. Our friendly staff will be happy to answer any questions you have. Our office hours are from 9:00 a.m. to 4:00 p.m. with extended hours in the summer months. Night registration available for late arrivals. A Dish-Washing Station near the lake!